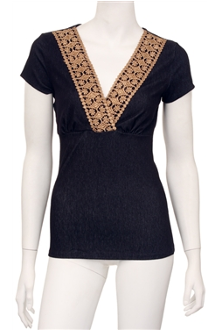 Short sleeve v-neck top with embroidery patch on the neckline. Empire waist. Black denim. Made in the USA. 52% cotton, 42% polyester, 6% spandex. Comes in sizes: Small; Medium; Large; Plus Size XLarge; Plus Size XXLarge.